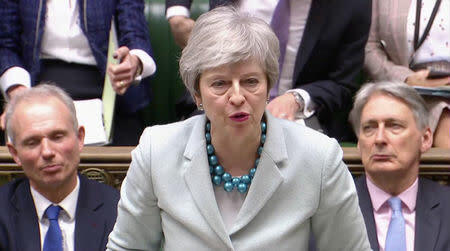 LONDON (Reuters) - British lawmakers voted on Monday to wrest control of Brexit from Prime Minister Theresa May for a day in a bid to find a way through the European Union divorce impasse that a majority in parliament could support. Lawmakers should now vote on a range of Brexit options on Wednesday, giving parliament a chance to indicate whether it can agree on a deal with closer ties to Brussels, and then try to push the government in that direction. The move underlined to what extent May has lost her authority, although she said the government would not be bound by the results of the so-called indicative votes on Wednesday. Monday's vote was put forward by Oliver Letwin, a lawmaker in May's Conservative Party, and came after the prime minister admitted that the deal she had agreed with the EU after two years of talks still did not have enough support to pass. Lawmakers backed Letwin's proposal by 329 votes to 302, and were almost certain to confirm their decision in the final vote of the evening on the overall "motion as amended". Earlier, May said the proposal would set an unwelcome precedent and could lead to support for an outcome to which the EU itself would not agree. "No government could give a blank cheque to commit to an outcome without knowing what it is," May said before the vote. "So I cannot commit the government to delivering the outcome of any votes held by this house." European Council President Donald Tusk said last week that all Brexit options were still open for Britain until April 12, including a deal, a departure with no deal, a long extension - or even revoking Article 50 and remaining in the EU. But nearly three years after the 2016 EU membership referendum and four days before Britain was supposed to leave the bloc, it was still unclear how, when or if Brexit would take place, with parliament and the nation still bitterly divided. May's deal was defeated in parliament by 149 votes on March 12 and by 230 votes on Jan. 15, but she had signalled that she would bring it back a third time this week. To get her deal passed, May must win over at least 75 MPs who voted against her on March 12 - dozens of rebels in her Conservative Party, some opposition Labour Party MPs and the Northern Irish Democratic Unionist Party (DUP), which props up her minority government but has voted against the deal so far. "Why would the prime minister ever expect us to give support to an agreement which is based on a lie?" DUP Brexit spokesman Sammy Wilson told BBC television.